Welcome to day 26 of 30. We are rolling through these posts and they will be over before we know it! Yesterday I flew to Russia for the PIR coffee festival and to see some family and friends, so once again this post is a little later than intended. If you read my post about evenness in extraction yesterday you might be waiting for my take on distributor tools in espresso preparation. As that is the primary topic for today’s post, I will indeed get into the details on these tools. But first, there are a few extra things that I want to cover on dosing and puck evenness that also impact how distributor tools work. First I want to address is tamping levelness. This of course is considered a standard expectation, and you may wonder why it is still such a problem. Solutions like PuqPress, and those training wheel tampers with the guide disc, make sure that you are applying pressure evenly to the grinds bed. I believe this would be more beneficial if dose density was 100% consistent. But would you believe me if I told you that the majority of uneven tamping issues are caused by uneven density in the coffee dose? When there is more density in one side of the dose, there is more resistance to pressure on that side. When there is more resistance in one portion, it will naturally create an unevenness in the tamper level. Interestingly, using a guided tamper that will only tamp level no matter what you do can create even more problems with an uneven density, because the majority of the force will tamp the highly dense portion, and barely tamp the less dense portion at all! A technique I have seen since around 2006 is to simply mound in the center of the portafilter basket and then tamp it all down. The wisdom of the time was that the grinds in the center would push outward to fill the exterior (lower density) portions of the basket. When you think about the vertical downward pressure applied by tamping you may wonder how this makes any sense at all, as I did in 2006. This type of thinking led to significant flaws in dosing and tamping simply because some voices in the barista community said it worked. This is the same reason that I always want you to experiment and test to ascertain your own results. It is the only way for you to become and authority and raise your level of expertise in the long run. So I want you to visualize tamping a center mound of espresso grinds straight down, resulting in a highly dense spot in the center. This is the obvious result, and while there are certainly many factors happening in the construction of the coffee puck (and my illustrations are pretty bad). Even a center mounded pile of espresso grinds can end up with uneven extraction. I want you to keep these examples in mind when we look at distributor tools, because there is a correlation here. Pretty much any downward force applied to a mound of coffee grounds will compact them where they currently sit. 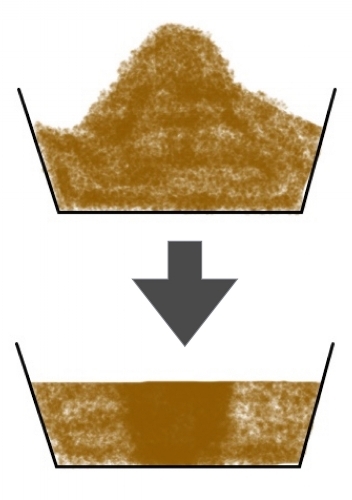 The more surface area that is actively compacting the grinds, the less can be adjusted later. So let’s look at our distributor tools. I will separate our current tools into what I call ‘wedge’, ‘triangle’, and ‘cross’ shaped distribution patterns. The following illustration shows the primary impact points of each of these styles of tools, but again they are a little more complex than this. The black portions of these distributor tools graphics show where the deeper portions of the tool will hit the coffee grind mound. As you can imagine, the more contact area the more potential compression of the grinds. If this compression point is on top of a higher density mound of grinds, it will result in high density sections of the puck. So immediately I want to say that a distributor tool is not a silver bullet that will fix your terrible barista skills. Another part of the distributor tool to consider is how deep the “blades” fall. Many tools can be adjusted in height in order to help create the preferred bed depending on the coffee density and roast degree. Often times baristas will adjust the tool depth as deep as possible, until it just barely makes a level surface (or there is no residual indentation in the coffee bed). 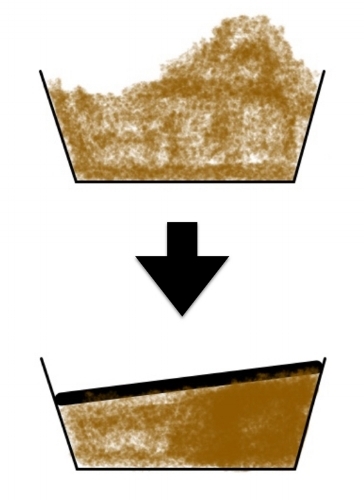 This method often results in maximum compaction high density areas. Looking at these three types of tool designs, you can see that they all work in similar ways. The metal “blades” fall down into the coffee dose, compress the coffee to different degrees, and rotate with the barista’s help to smooth out the coffee bed. While I have witnessed easier and more consistent results with the wedge style tools, it should be possible to get a good result with any of them. Sasa Sestic won the WBC in 2015 using his 4 blade tool, so clearly it can have good results. His advice when I asked about the OCD was to ensure the blades were set a bit higher and then twist the tool as you are inserting it. The purpose seems to be to get more lateral movement of the grinds as the downward force is being applied. Another thing to think about is the fact that none of these tools actively manipulate the grinds below the level of the blades. What you get is a bit of a pushing of the grinds in hopes of “filling in the gaps” as the tool pushes everything more or less together. The best way to achieve evenness however is still to ensure the density is even prior to using one of these tools, because while they will fill in the gaps, they don’t change where the density of the puck is located. That is what I think everyone is missing. So once again every time it seems like we have taken care of a problem (especially in espresso), other factors become much more visible. Maybe one day we will solve all of the issues, but until that day you still need to hone your skills, pay attention to all of the details, and push yourself as a barista as much and as often as possible. I hope this post has given you a little more insight into dosing, tamping, and the use of distributor tools.